Wilderness Programs are not available at the present time we hope they will be available again soon. New textbooks will not be printed until late Summer 2016. Wilderness Emergency Care - First Aid is a classroom, video-based, instructor-led course from ASHI that teaches students about the wilderness environments which create special situations not usually encountered in an urban or suburban environment. After a disaster, even urban environments may need to be treated as a wilderness environment when it comes to first aid and patient care. This course is the choice of many recreational skiers, climbers, mountaineers, and hiking trail guides. Basic first aid and CPR skills will be taught in the classroom on the first day of the course, and practiced hands-on in the wilderness environment on day two of the course. The course also meets the requirements for Wilderness First Responder Refresher and the Boy Scouts of American Wilderness First Aid curriculum. 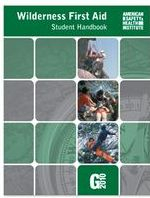 AUDIENCE: This course is for individuals who need wilderness first aid knowledge and skills, but are not professional responders, including adventure guides, outdoor enthusiasts, trail guides camp counselors and administrators, camp participants, park and forest rangers, and other occupations that work in a wilderness environment or who needs a completion card in order to meet certain job, regulatory, or other requirements. Individuals taking this course are recommended to take a CPR / AED and Basic First Aid course. BOY SCOUTS OF AMERICA: This course meets the Boy Scout of America requirements of Wilderness First Aid following the upgrades from the Emergency Care and Safety Institute (ECSI) and the American Safety and Health Institute (ASHI). COURSE FORMAT: This course is classroom-based which includes instructor, video, and skills interaction throughout the course. The course is approximately 18 hours (two days) in length. CERTIFICATION: Upon completion of this course, students receive a ASHI Digital Certification Wilderness First Aid course completion card. If you prefer a traditional card, there is an additional $5.00 charge to the class cost. Certification cards are valid for 2 years.